I am continually amazed at the magnificent, elegant looks that can be achieved by manipulating fabric. Catherdral Window is one of the first traditional quilt patterns that captured my imagination. Folding squares of muslin yielded a textured, layered look. Easing the edges produced curves. Scraps of fabric created a lively design. I was smitten. 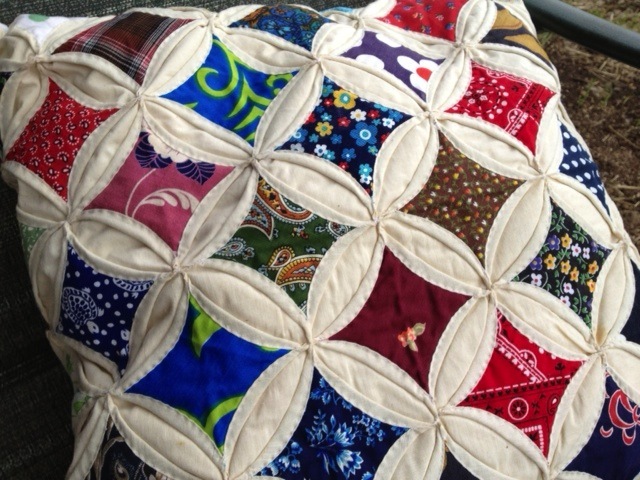 My mother made only one quilt (with pillow to match) in her life. She had been inspired by a Catherdral Window pattern potholder she found at a crafts fair. With my father’s help, they carefully cut squares of muslin by hand (rotary cutters had not yet entered the quilt world). She scavenged high and low for scraps of fabric to fill the windows, and stitched each block by hand. She loved the result and proudly presented me with the quilt and pillow. And though she had plans for more……..she never made another. I love this quilt.